Well I went to my first class in sketching and drawing on Thursday and I really enjoyed it. As it was the first week I think it was more for the tutor to assess what level we were all at. We were given large pieces of paper, easels and charcoal to draw various items on a table e.g. wine bottles, glasses, pieces of flint, pine cones and a vase. Apparently we are all pretty good at getting the proportions right and were taught a measuring method to help with it. Drawing with charcoal was something I had never done before but I really enjoyed it. I got extremely messy and was a bit paranoid about getting black smudges all over my face. I want to push my own limits if I can so I tried to use all of the paper(A2 size) and not draw tiny pictures. We have homework, to get a sketch book and draw as much as we can and we have to draw an apple!! We are working on drawing what we SEE not what our brain tells us is there. I’m really looking forward to next week now! Sparkleknits has knitted two Odessa Hats, pattern by Grumperina and I wanted to give it a go myself. I cast on with some cream Debbie Bliss Rialto DK last Sunday but by Monday evening I realised there was not enough yarn in the ball to make an entire hat so I frogged it. But by then I was hooked on the stitch pattern, there’s a ssk and a yo which gives a really nice stretch spiral pattern. I had a root around in my stash and discovered some Elle Stretch DK in a maroon/burgundy colour that I wanted to make long socks from. And then I had a lightbulb *ping* moment “I could knit stretchy Odessa patterned long socks”!! So I have begun a toe up sock with the Elle Stretch on 3.25mm dpns using the Odessa stitch pattern on a widdershins sock pattern. It’s working ok so far. I’m about to turn the heel which may be challenging but I’m gonna give it my best shot. P.S the pic is the Three Little Pigs jumper I made being modelled by it’s owner and I think he looks extremely cute in it!! Long time no speak. I went to Bristol to visit my friend and got in some knitting time on the train, I cast on this…. … and finished it a week later. 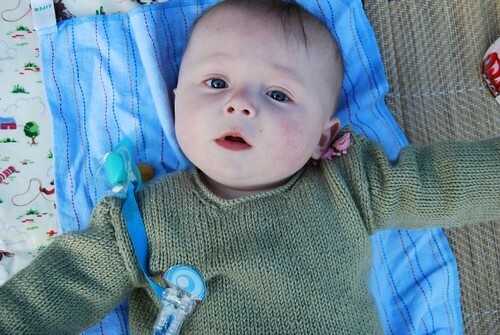 I love baby knitting – it’s so quick! Don’t you think this tank top is adorable, I almost wish it was big enough to fit me. I knitted it in the round from the bottom and then split at the arm holes. I didn’t cast off stitches under the arms as instructed, I put them on a safety pin instead and I didn’t cast off at the shoulders or back of the neck either. I grafted the shoulders with kitchener stitch and then when I picked up stitches around the neckline I did it in the round and just knitted the ones across the back of the neck. Therefore apart from sewing in ends and the kitchener stitch across 10 stitches on each shoulder I didn’t sew any part of this up. Which is exactly the way I like it. I think it worked out pretty well and I really like the 3 stripes that I added just for a bit of detail. It’s for my pen friend’s baby Ben and is a size 6-12 months. I knit it with less than 2 balls of Debbie Bliss Baby Cashmerino on 3.25mm and 4mm needles. I’m going to use the same in the round principal to knit myself a black tank top in a 4ply yarn and then I want to knit a grey one with either a rib/cable or other stitch pattern on it. 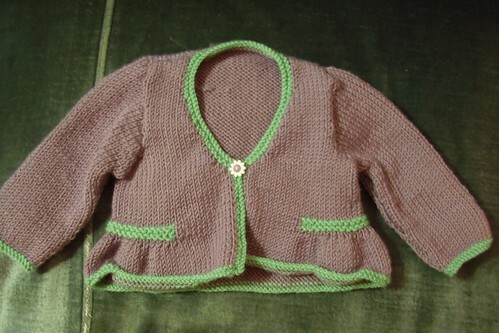 I have also finished the Sweet Pea Cardigan for Leah that I made from a Sirdar Snuggly pattern. 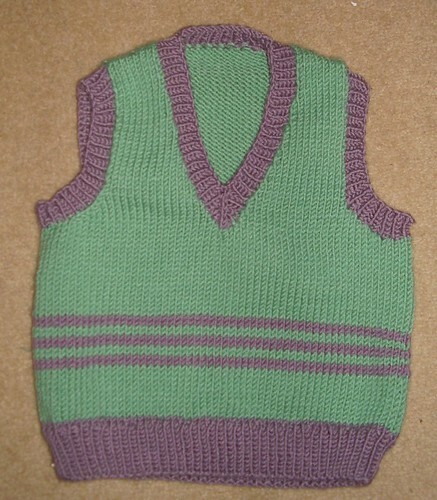 It’s knit in the same yarn as Ben’s tank top but I reversed the colours. I knit this in one piece and then knit the sleeves at the same time. Yes I really hate sewing seams that much. I need to block it tonight as I’m seeing Leah (and her parents) tomorrow at a reunion (we used to all work together) picnic so I want to give it to them then. It’s 0-6 months size so I’m hoping she’ll get enough wear out of it. And in other news….. I’ve re-read Fire And Hemlock by Diana Wynne Jones which is one of my all time favourite books because I listened to Spinningerin’s podcast about Tam Lin and F&H is based on Tam Lin too. It’s a fantastic book and I get more out of it everytime I read it. My Maisy Tote is proving to be very useful as it’s so big and sturdy so I’m very pleased with it. Less than 3 weeks to The Knitting And Stitching Show at Alexandra Palace in London so I’m starting to think of my shopping list already. On Thursday I start an evening course at the local college called Introduction to Sketching and Drawing as I’m hoping it will help bring out my creative side. I’ll let you know how I get on.